Frequently Asked Questions About BuyForMe And ShipForMe Services. Need Help? You Have Come To The Right Place! 1. How to apply for a USGoBuy's membership? Please click here and fill-in all required information. Then you will receive a confirmation email from USGoBuy immediately. 1. What will my address on USGoBuy.com look like? Sign in your account and then you will find the address as follow in the middle part of the page. 1. The recipient name must be your legal name and same to the name associated with your account. Any discrepancy will result in identification verification and the delay of your package forwarding. 2. Do put # or PMB before your mailbox number. DO NOT put “Suite” or other identifier because it is not accepted by the US Postal Service according to the Domestic Mail Manual. They may refuse to deliver your packages because of the incorrect identifier. 2. How to use my U.S. address? Fill in your USGoBuy address when checking out. Do not forget to put your unique mailbox number in the second line of the shipping address. NOTE: Some merchants may request that your shipping and billing address must be the same one. If so, we recommend you to use our BuyForMe Service. We will use our own credit cards to buy the items you want. 3. Can I use USGoBuy address as my billing address? No. Your USGoBuy address can only be used for receiving packages. All other purposes are prohibited, including but not limit to: using our address as their credit card billing address, indicating or using our address as their residential or business address. Abusing your USGoBuy address will result in account closing permanently and all your packages will be returned to sender immediately. 4. Can I receive letters with my USGoBuy address? I am sorry but we don’t accept or forward letters. As Usgobuy will only process packages and envelopes containing items you have purchased. We are not a mail forwarding agency, and we do not and cannot ship documents or other mail to you. Any mail or packages addressed to you that do not contain items of value will be refused. 5. Can USGobuy ship the parcel to other mail forwarder address (P.O. Box addresses) in US? No. We can’t ship parcel to other mail forwarder address (P.O. Box addresses) in US due to frequent online shopping fraud cases. 1. What kind of services that USGoBuy can provide? After you became a USGoBuy member, you will enjoy the ShipForMe and BuyForMe services as you like. 2. What is the general procedure of ShipForMe service? Step 1: YOU sign up and get a U.S. address from USGoBuy.com. Step 2: YOU shop and ship your items to this address with your mailbox number. Step 3: WE receive the packages and input them into our system based on your mailbox number. Step 4: YOU see your packages from “My Packages” in your account. Step 5: YOU pay the estimated shipping fees while initiating a shipment request. Step 6: WE consolidate your packages (as minimum as we can to save your money) and ship them with your designated carriers. Step 7: WE upload your tracking # and YOU wait for your items at home! Step 8: Extra shipping fees will be credited back to your account. You can use it for your next shipment or request a refund. Notes: Recipients must be the same to the name in your account. So please make sure sign up with your legal name and use this name as recipient for all your shipments. 3. What is the general procedure of BuyForMe service? Step 1: YOU prepay the total amount of the items you want to buy and send us the links of the items with necessary specifications (Size, Color, Quantity, and so on). Step 2: WE buy the items for you with our alternative address and pay them with our credit card. Step 3: WE receive the packages, bring them back to our warehouse and input them into our system based on your mailbox number. Step 5: YOU pay the estimated shipping fees and initiate a shipment request. Step 6: WE consolidate your packages (as minimum as we can to save your money) and ship them with your designated carrier. 1. Which kind of carriers can we choose? As our company have built a long-term cooperation relationship with DHL、FedEx and USPS. So you can choose any of them according to your own requirements at the lowest price. After you submit a shipment，we will email you to let you know when your goods are shipped. You can then log in to your account to check "My Shipments". And also you can track your parcel according to the link provided in the email. The following links are only for your reference. At present, we accept Credit Card, PayPal, WebMoney, My E-wallet to pay shipping fees online. There are three ways to top up the E-wallet, Alipay, Western Union and Wire Transfer. And you can use most credit cards through your PayPal account, including American Express, MasterCard, Discover and Visa. NOTE: We don't support PayPal and credit card payment for basic customers from Algeria, Indonesia, Morocco, Russia, Yemen, Nigeria,Vietnam,Tunisia,India,and Ghana for security reasons. 2. How to top up My E-wallet in My Account? Step 1: Click at Deposit Money under My E-wallet in My Account. Step 2: You’ll find three methods: Alipay, Western Union, Wire Transfer. Choose one from them. Step 3: Fill in all the related information of your account. Step 4: Click "submit" and complete it. NOTE: Please note that our financial department will check your payment request within 1-2 business days. The amount will be topped up into your E-wallet once we receive your payment. 3. Can I top up My E-wallet by PayPal or WebMoney? Sorry, you only can top up the E-wallet by Alipay, Western Union and Wire Transfer. If you intend to use PayPal or WebMoney to pay the shipping fees, please choose it as your payment method while requesting shipment online. For more details, please visit PayPal and WebMoney page. 4. How to use My E-wallet and PayPal (or WebMoney) to pay the shipping fee at the same time? Please check the box in front of the option of using my E-wallet balance to pay the shipping fee when the system requests you to choose a payment method while requesting shipment. If the balance is more than the shipping fee, the fee will be all deducted from your E-wallet. If not, the system will step in to the PayPal page. Please log in your PayPal and pay the difference of price. 5. How to withdraw the money in my E-wallet? Please click Withdraw in Account Activity, fill in the related information and submit your request. We will refund the money to your PayPal account or WebMoney account within 1-2 business days. We are sorry that it is not available for Western Union or Wire Transfer. 1. Can I declare another value on my items in order to lower Import Duties and Taxes? In all circumstances, the member represents and certifies that any value provided to USGoBuy.com is true and accurate. We declare the value of the items with the price you provide with us and you are sole responsible for subsequent results caused by inaccurate declared value. For item, if it is a gift, kindly notice you also should declare it according to the identical market value. 2. Do shipping rates include Import Duties and Taxes? While our shipping rates include all shipping and handling costs, you may still be responsible for certain Import Duties and Taxes levied against your shipment by your country. USGoBuy.com is not responsible for any delays in shipping associated with customs difficulties. 1. Should I have to buy insurance for my products? No. it is up to you. While we kindly suggest you to buy insurance for expensive items. 2. How much of the insurance? The insurance is 2% of the declared value of your items. 3. How do I file a claim for damaged or lost items? If your parcels are not delivered, or items are missing or damaged, please contact us at claim@usgobuy,com to begin the claim process. For more details, please check our blog page. 1. What are the acceptable documents? 2. Do I need to submit 1583 form? The Form 1583 is requested when we concern about the safety of your account. Under that situation the parcels will not be shipped out until the account is verified. To verify your identity and protect your account, you'll need to scan or take pictures (using your cell phone, for example) of the Form 1583 and 2 verifiable identifications and upload them into your account, click Personal Profile in Membership Settings . 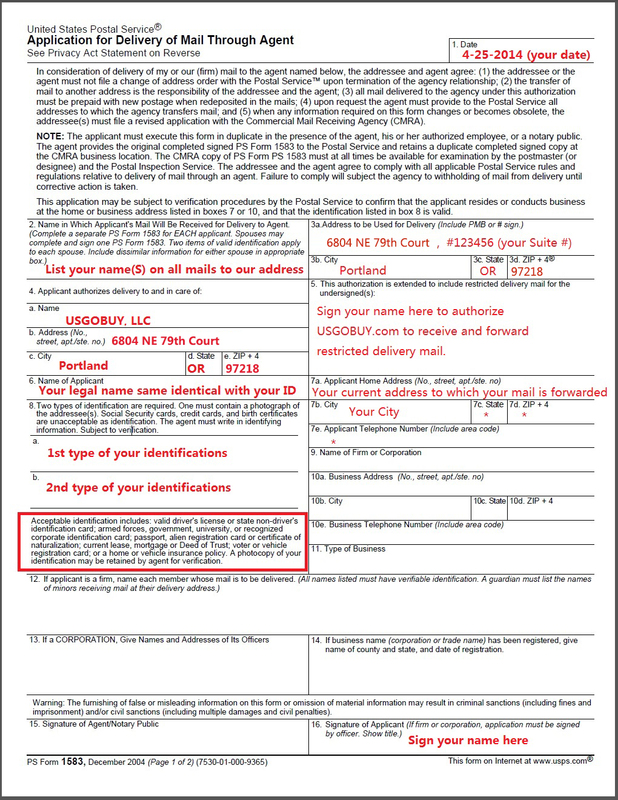 You don’t need to mail the original form to us or have it notarized. 1. How can I get coupons? 1) Share your experience in USGoBuy on social media, such as Facebook, blog, Twitter, etc OR promote our service on some websites, forum, etcAfter sharing or promoting, please send the external address link and your contact email to news@usgobuy.com. We will send you $5 coupon on orders over $30 for each share or promotion to your account after review. Please log on your account, click Refer to a Friend and fill the related information. If your friends accept your invitation and sign up successfully, he or she will get a $2 coupon. And you will get $10 cash-back once a new customer sends the first package. You can recommend USGoBuy to up to 5 friends in one day. 2. How can I use coupons? You will find three types of coupons in your account: unused, used, and expired. Validated coupons are marked with color, while invalidated ones marked with gray.In the checkout page of your ShipForMe order, you will be able to see all the available coupons. Please choose a coupon by clicking “Apply” and check the total amount before you make payment. 1. You are able to use coupons to pay for the ShipForMe order and the international shipping fee, coupons can cover at most the total amount of the ShipForMe order. 2. There is lowest consumption limit for both the amount of the ShipForMe order and the international shipping fee. The amount of the ShipForMe order doesn’t include all the fees aroused from BuyForMe order. 3. You won’t get the difference back if the coupon amount is larger than the order amount but in this case, you will be able to use the difference to deduct the same amount when you need to make a second payment. 1. How is the shipping fee determined? For USPS, shipping fee is determined by the actual weight of your parcel. While for DHL and Fedex, the shipping fee is determined by the greater of the actual weight or the dimensional weight. 2. What is "DIM weight"? For a list of countries we serve, view the registration form. Please take the time to click on the country of your choosing, as not all shipping options are available in all countries. If a country is not listed on our website, we do not offer service. 4. Do shipping rates include Import Duties and Taxes? 5. Why there’s no information in “My Packages” after my parcels have been delivered to your warehouse? If your parcels are delivered by us but there’s no information in “My Packages”, it is probably because there’s no/incorrect mailbox # on your parcels. Please contact us immediately by sending the tracking # of your parcels and the mailbox #of your account to service@usgobuy.com. 1. USPS may send your package to another address by mistake, but it still shown to be delivered in their website. For some high-cost items, we suggest you to use UPS, FedEx instead of USPS. 2. For the package delivered on weekends, it will take more time for info update. Generally, it should be added to your account on next Monday. 6. What will happen to package exceeding 60 days' free storage period? Package exceeding free storage period will be discarded and USGoBuy reserves the right to charge customer for longer storage time on behalf of customer. Any package extension must be requested within 5 days before package expired. 7. When will the additional fees be charged in package condolidation? No fees will be charged when submitted packages are no more than 10 per time. Each additional package over 10(exclude) will be charged $0.99.